When your dream house includes a pool, summer days spent splashing and sunbathing are all you see. It’s rare you think about the hard work that goes into maintaining it. Any pool owner knows that these hidden details make up the majority of pool ownership. Not only do you have to clean the pool regularly and winterize it when the swimming season is done, but you also have to think about protecting it. But what are the threats to your pool? Most pool protection is relatively straightforward. There are pests or critters you want to make sure don’t invade your space, or you want to make sure neighborhood children don’t come for a swim without supervision, which is a recipe for disaster. A fence is the first line of defense against these nuisances. When it comes to fence options, get ready to go swimming all over again because there is an ocean of them. Fortunately, we’ve narrowed down 20 of our favorite pool fence ideas to make the choice more manageable for you. Use this list to start your pool fence search. You’d be surprised! Fences range in type based on the materials they are made of as well as their functions. Some of these fences keep out intruders. Others protect your own children from accidents. Whether you’re looking for the sleekest, most stylish landscaping upgrade or the most basic pool protection, our list of swimming pool fence ideas has got you covered. Mesh may conjure images of flimsiness in your mind, but we urge you to reconsider your old notions. There are many benefits to a mesh pool fence. First and foremost, it is incredibly difficult to climb! If the protective function of a fence is your top priority, a mesh fence’s resistance to climbing is reason enough to consider it. But a mesh pool fence doesn’t sacrifice anything on the aesthetic front either. Mesh fences offer all the protection of other fences with a view that is rare to most other types of fence. The transparency of these fences gives them a low-key modern look that looks pleasing without being overly showy. Yet another benefit of a mesh pool fence is that it is straightforward to install. All you have to do is place the metal or wood posts and stretch the usually polyester fabric between them, and then you’re done! This option is also known as “the backyard fence,” whether or not you install it as a barrier between your yard and your neighbors’ yards. When you read the title of this article, it’s likely wood was the first material that came to your mind. There’s a reason for that. Wood is a classic fence material for its sturdiness, the privacy it provides, the way it blends into a landscape, and its beauty. Before you install a wooden fence, remember that it requires its own maintenance, so you may be adding to the workload you already have with your pool. If that doesn’t bother you, you’ll enjoy the privacy a tall wooden fence can provide and the customization options, like various types and sizes of wood and a range of paint jobs. What do we mean by “natural” fence? We’re certainly not just saying to lie on an inner tube in your pool and wait for a fence to materialize around you. By our definition, a natural fence is any fence that consists of naturally occurring landscape elements. We’ll delve deeper into the world of natural pool fences a little later, but for now, we’ll highlight the natural fence that consists of shrubbery. There are a lot of synthetic and artificial elements and instruments that accompany a pool. Surrounding your pool with tasteful vegetation can offset these harsher, manmade sights. Another bonus of the plant-based natural pool fence is that it is a great deterrent to trespassers, especially if you use a particularly tricky plant. We’re not suggesting you surround your whole pool with rose bushes, but there are plenty of shrubs that make a mess of clothes that would make for fine fence material. We’re foregoing material here to talk about style. And the style we’re highlighting here couldn’t be more traditional. The picket fence is a hallmark of residential areas. Just like a pool, it can signify stability, arrival at an elevated station of life, and the fact that you are home. Beyond its symbolic significance, a picket fence is almost infinitely customizable. These fences come in metal, wood, fiberglass, and plastic. And they come in a plethora of sizes and styles and in almost every color. Here, we return to a variation on the natural pool fence. But we figure this one is so distinct that it’s worth highlighting on its own. A stone wall speaks of sturdiness, and if built in the right way and of the right material, it can also be almost unclimbable. Certainly, it offers a level of privacy that is unparalleled in almost all other fence materials. Plus, there are few things more relaxing than swimming in a pool surrounded by stones. A stone wall pool fence makes you feel as much a part of nature as any natural fence out there. We’re back to discussing materials because when you’re shopping for pool fences, you need to think about all of the variables. The benefit of aluminum in a fence material is that it is less expensive than wrought iron. See below for our discussion of wrought iron’s particular benefits. Aluminum is another material that requires quite a bit of maintenance. The maintenance involved in an aluminum fence is mostly to keep it from rusting in wet weather conditions. But with the proper care, an aluminum fence can last a long time. Fans of the aluminum pool fence will also point out the powder coating on many aluminum fences, which adds a level of sophistication and visual polish to your pool fence. If you want DIY pool fence ideas, look no further. The installation of a no hole pool fence is an entire project you can oversee from start to finish. This is a boon to those homeowners who like to get their hands dirty, and it’s also a selling point to those who want to save money on installation. The “holes” a no hole pool fence refers to are the holes in the ground that other fences require for their poles. The no hole fence avoids them with a system of bases that are weighed down by sand or water. These bases are heavy enough to hold the poles, and then all that’s left to do is install the fence material between them. It’s almost too simple! 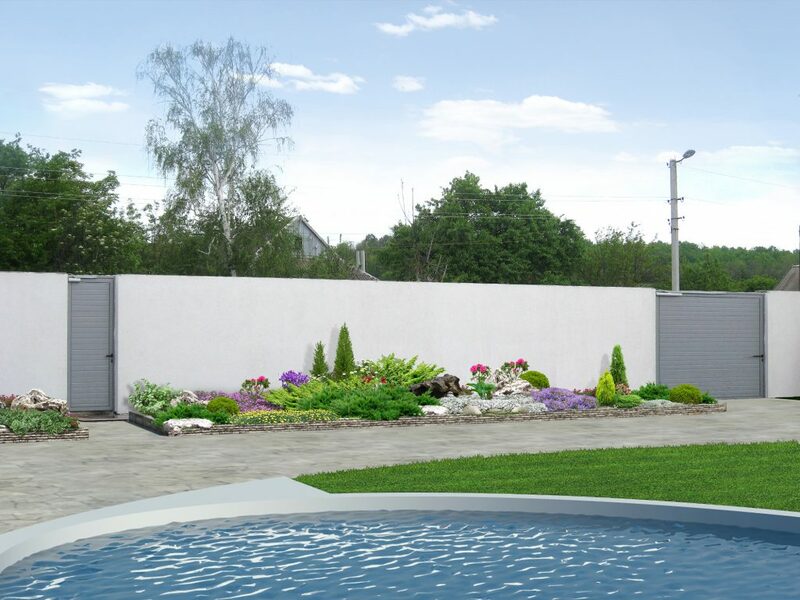 If you want the protection of a fence without the minor destruction of your property that most fences require, the no hole pool fence is an elegant solution. The child pool fence is a variation of both the no hole pool fence and the mesh fence. The difference with this fence is that the mesh material is reinforced especially well to keep those kiddos safe. These fences are quite durable, as a result of the specifications to which they’re manufactured. Many of them feature triple-reinforced poles and UV resistant materials. A good child pool fence will also include a self-latching gate, just in case you forget to latch it yourself. When you see all the benefits, it’s easy to spring for a child pool fence even if you don’t have children. An above ground pool fence is similar to a child pool fence and improves quite a bit on the other fences’ resistance to climbing. Many above ground pool fences are too slippery to even get a hold on, much less climb. This climb resistance keeps kids away from the pool when you don’t want them near it. Another benefit of the above ground pool fence is its beauty. Many of these fences include a platform and are made of materials so pleasing to the eye that they elevate the entire pool to the level of a work of art. Let’s get this out of the way. Wrought iron is expensive. That said, wrought iron pool fences wouldn’t still exist if they didn’t have their benefits. So what are they? The most obvious benefits of a wrought iron fence are strength and durability. Once you install a wrought iron pool fence, it will take more than hell or high water to uninstall it. We’d be remiss if we didn’t mention rust here, just like we did with the aluminum pool fence option. But if you’re willing to maintain your iron fence to the level it needs, you’ll end up with as stable a fence as they come. And the decorative designs available in wrought iron fences add a beauty many of the other fences can’t provide. The retractable pool fence is perhaps the most futuristic of the fence types highlighted here. Retractable pool fences come in a variety of styles. There are fences that sit directly on top of the swimming pool and which you roll up when it is time to swim, similar to a pool cover. There are fences that form enclosures that completely shield the pool. As you can tell from the ease with which you can dismantle a retractable fence, installation is quite easy as well with fences of this type. They are also durable and elegant because of the transparency of most retractable fence materials. The biggest downside of a retractable pool fence is that it will cost you a pretty penny. But if you value the flexibility and simplicity these fences offer, they more than justify their price. Speaking of expensive pool fences, we are now in Fancy Land. Glass pool fences are fashionable at the moment, and those who want to install fences of this type pay out the nose to take part in the fashion. Installers may charge five digit figures for these fences without batting an eye. It goes without saying that glass is see-through, and the aesthetic benefits are literally plain to see. A glass pool fence is the best way to get maximum protection with minimal addition to your landscape. The flip side of this visibility is that while glass pool fences may offer protection, they offer virtually no visual privacy, though they do the job of keeping out unwanted guests. Like with many of these options, the decision to purchase and install a glass pool fence is all about deciding the features that are most important to you and what you’re willing to sacrifice to have them. Galvanized steel is one of the materials used in fence paneling. This material offers safety and functionality, though it perhaps sacrifices some of the elegance of the other options. Vinyl has a lot going for it. Unlike many of the fences we’ve highlighted so far, it’s almost completely maintenance-free. And the benefits don’t stop there. Vinyl pool fences, which are often made of high-grade PVC, are durable yet lightweight. They weather the elements well. Many of these fences also come with lifetime warranties. Best of all, the vinyl fence is one of the more affordable options on our list. This option may sound blunt and bulky, and it can be. But there are ways to shape the cement that steer clear of the parking garage vibe. And there’s nothing like the absolute privacy you get from a well poured and shaped cement pool fence. The cinder block pool fence is a more basic version of the cement fence, but there are ways to work with cinder blocks that make this fence more visually appealing than it may sound at first. If it’s aesthetics you want, a decorative pool fence can help you pull out all the stops. The decorative fence is best procured by working with a designer who can customize the fence to your vision for the fence, your pool, your property, and your personality. Go art deco. Think completely rustic cabin in the woods. Picture yourself surrounded by marble. This is the kind of thinking you can indulge when you spring for a purely decorative pool fence. We highlight this type of wood fence separate from the classic tall wooden pool fence because it offers a unique look and approach to privacy. The slats in this type of fence run horizontally instead of vertically, and depending on the polish of the wood, you can get a look similar to an above ground pool fence that looks sleek and modern. Sometimes a fence isn’t a long-term solution. Use one of these usually aluminum fences when that’s the case for your pool protection needs. A temporary pool fence is not necessarily the same as a no hole fence. Many of them require drilling into your patio or deck to ensure the fence stays put, however temporarily. For our final fence, we return to the beauty and simplicity of wood. And instead of long slats, these fences provide a simple lattice pattern that sacrifices some privacy for decorative qualities while maintaining safety. We assume you need a swim after doing all this research on pool fencing. There are a lot of options from which to choose. We trust these pool fence ideas have sparked ideas of your own. We encourage you to follow that inspiration and take a look at all we have to offer when it comes to swimming pools and hot tubs. CLICK HERE TO VIEW MORE POOL FENCE PRODUCTS!